Decent product for someone struggling with weight transfer. Easy to use, small and light. Weight transfer is imperative to a solid, consistent golf swing. 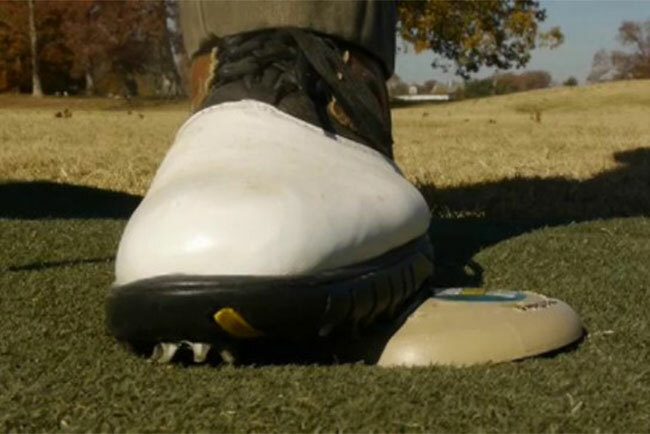 Without it, a number of problems will creep into your game and in order to stop this happening, retired Federal Parole Officer Carl Papa invented the Pocket Pin High Pro. The device is simple – essentially it’s a circular shape you place under your front foot that clicks when enough weight is placed on it. To make it click therefore, a player must transfer their weight from their back foot to their front foot. It can, on occasion, be slightly temperamental and the odd click does not sound but on the whole it works well. It’s also light and can easily be left in your golf bag and taken out when needed. A few minutes with this on the range and you will be able to feel what proper weight transfer feels like.